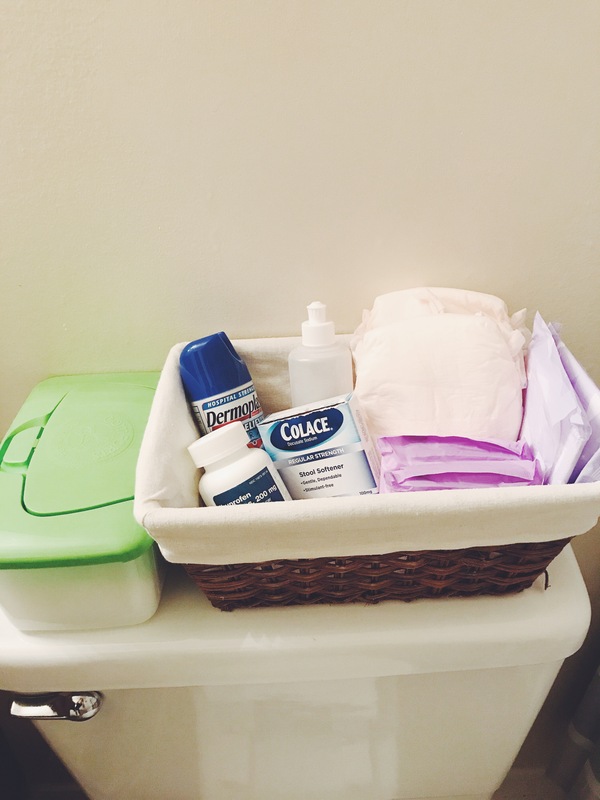 Since this is my second time preparing for the extremely glamorous task of recovering after childbirth, I thought I’d put together a cute basket for myself ahead of time with some of the things I will need to get me through it. (The basket itself is cute, not the items inside for clarification.) Really, there’s nothing cute about the hot-wreck that is recovering from childbirth haha. It ain’t pretty, but it’s so much easier when you’ve got these items on hand! I’m keeping this basket in the bathroom on the toilet, duh. But I love the idea of it all being in the one basket because then if I am somewhere else, my husband can just grab it all and bring it for me, without wondering what the heck I mean by “get the bottom balm” HAHAHA. 1. A variety of pads. Start with granny-style Depends honestly. The after-birth bleeding can last a few weeks, and it’s supposed to start heavy and gradually taper off. I got the Silhouette Depends to wear the first week because they aren’t bulky and diaper-feeling, but they are still heavy duty. Then I “graduate” to using regular underwear with the maxi-pads inside (these nighttime ones.) THEN I move down to the regular pads, etc etc. Mainly you want to get super heavy duty ones down to just liners so that as you bleed less, you can use less support. Ps- get the ones with wings, I find that they are much better for this purpose. I HATE PADS with a passion btw. So this part is the worst for me hahaha. 2. Bottom Balm by Earth Mama Angel Baby. Oh my GOSH. This stuff is an absolute life saver. It’s all natural and I went through an entire tub my first time. It really does soothe everything down there, and I feel confident about what I’m putting on my body. It can be used in combo with the Dermoplast spray too. You could even keep it in the fridge, which I did sometimes, and the cooling sensation makes you feel like you aren’t going to die for a minute ha. 3. Dermoplast.. Spray it. All the time. Some people don’t like this stuff, but it helped me a ton. The hospital usually gives you a can of it, but you can buy it from the store if they don’t. I got an extra one just in case because it’s like $5 and worth it. 4. A perineal irrigation bottle. Because wiping is just…a no-go for a while haha. This one is also something the hospital should give you, but you can grab one from Amazon. ALSO I have heard that this one by Fridababy is amazing because it’s angled. I didn’t spend the money on it because the regular bottle worked fine for me last time. But it does look pretty spiffy. 5. Colace. A small bottle, because using the bathroom after labor is terrifying. You fill in the blanks haha. 6. Ibuprofen. For any pain, and it’s breastfeeding friendly. 7. Unscented wipes. You won’t use these for a while, until wiping isn’t freaking awful, but getting some is a good idea for when you’re ready. 8. Witch Hazel or Medicated Witch Hazel (Tucks) pads. Yes, commonly for hemorrhoids, but using them for perineal healing is also awesome. Last time I kept the actual bottle of Witch Hazel in my basket and I would just spray it into a pad each time. It worked great. 9. Earth Mama Angel Baby Postpartum Bath Herbs. You can use these pads frozen for the first few days and then after the initial few days, you can use dump them in a warm bathtub to promote healing and get some relief. I actually did not do these last time, but heard such great things about “sitz bath herbs” that I decided to try them this time. Okay I think that’s it! One thing that’s also helpful is a donut type pillow to sit on, which helps take pressure of your bum. 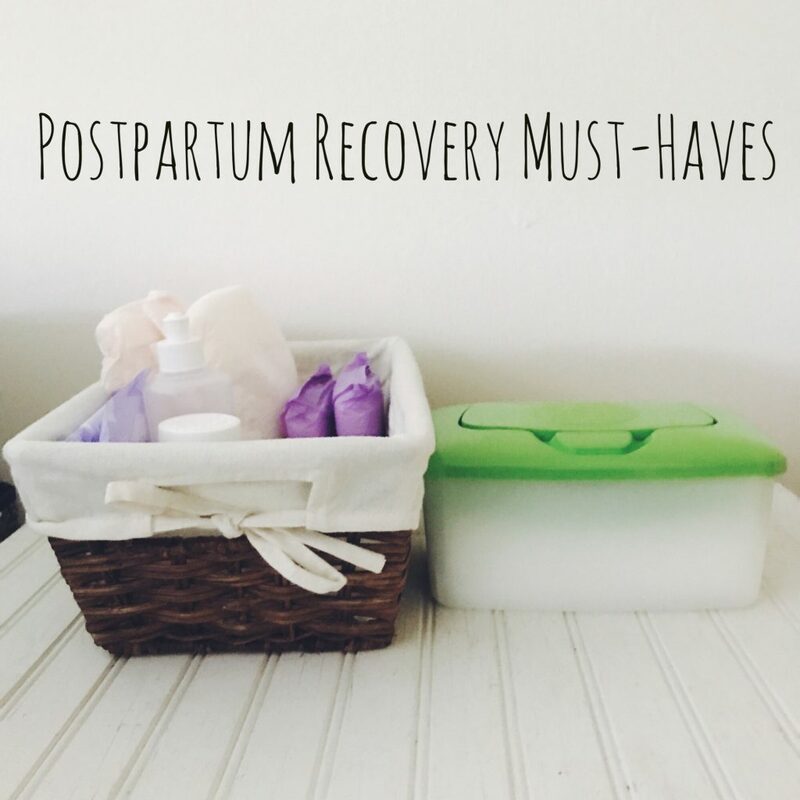 But obviously that doesn’t fit in a basket 😉 Some WINE is also a great postpartum recovery item….just saying. Some really good C-section friendly undies that accommodate the scar area while it heals. These Kindred Bravely underwear have rave reviews and are beautiful. A belly binder– I was told this is not for “losing the baby weight” but for support, so that your insides don’t feel like they will fall out! Have I forgotten anything awesome?! Let me know what you found helpful in your experience.